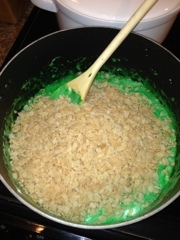 Simply Southern Girl: Rice crispy treats- lucky charm style! 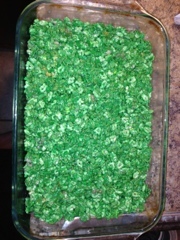 Rice crispy treats- lucky charm style! 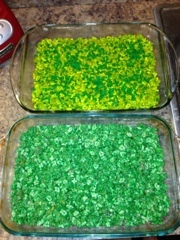 I will be working this St. Patrick's Day.. no big deal for me. I'll be sure to wear green, but other than that I won't be missing out on a St. Patrick's Day bash or party at a friends house. 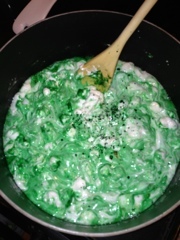 However, living in a college town, St. Patrick's day is a "big deal", read excuse for a party! I know that many of my employees on Sunday would rather be out with their friends then at work! So I figured why not surprise them with a treat to celebrate the day!!! 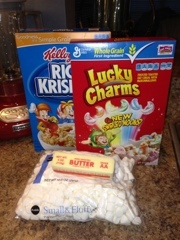 I asked an employee if she wanted me to bring/bake something- and she asked for Lucky charms- I figured I'd kick it up a notch and I decided to make these! 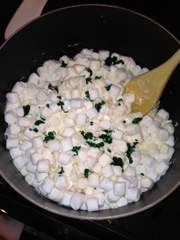 They are quick, easy, taste good, and are in theme! 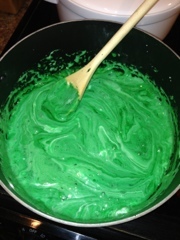 3) As marshmallows are melting I decided to add a bit of green food coloring for an extra pop of green. 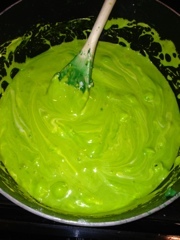 I used plain green on the left, and green with a touch of yellow on the right. 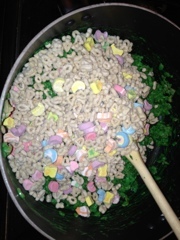 You can skip this step if you want the lucky charms to be more defined. 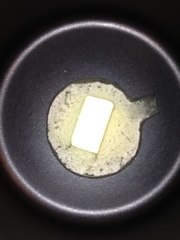 7) transfer to a buttered 9x13 pan and flatten with a buttered spatula 8) cool then drizzle with melted chocolate and/or add sprinkles if desired.I decided to add mini shamrock candies to the treat on the right above or top below. 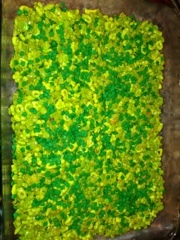 Once cooled cut to desired size, and share with those "lucky" enough to partake in the fun!!! (yes I know they are in an "Eaterish basket... I am bringing the basket to work for something else so figured I'd be resourceful!! Don't forget to the GIVEAWAY for a monogram ROBE.